Removals of the address the e-mail can be made after the entry into the group. We click on the menu File, and we choose from him the option Groups. From the right we choose the group across the single click, and then from the left menu we choose the position Edit group e-mails. 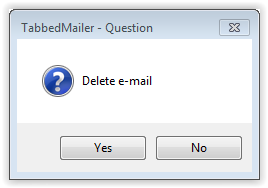 We choose the address which e-mail we want to remove, and then we click from the left menu on the option Delete the e-mail. The program will ask us whether we are sure that we want to remove from our database the chosen address. We click on the button Yes.